NEW YORK - A traditional Mediterranean diet heavy in olive oil and vegetables may help older people lower their risk of adult onset diabetes - even without counting calories or shedding weight. Spanish researchers studying more than 400 adults found that those following the traditional diet were less likely to develop diabetes over four years than those instructed to follow a low-fat diet, according to findings published in the journal Diabetes Care. A traditional Mediterranean diet is generally high in vegetables, fiber-rich grains, legumes, fish and plant-based sources of unsaturated fat - particularly olive oil and nuts - while being low in red meat and high-fat dairy. For the study, researchers led by Jordi Salas-Salvado of the University of Rovira i Virgili in Reus, Spain, followed 418 adults between the ages of 55 and 80, each of whom had at least three risk factors for heart disease such as high blood pressure or smoking. They were randomly assigned to one of three diets: a Mediterranean diet with emphasis on more consumption of olive oil, the same diet with a focus on getting unsaturated fats from nuts, and a diet cutting all types of fat. None of the groups were told to limit calories or get more exercise. After four years, 10 to 11 percent of those in the two Mediterranean groups had developed diabetes, compared to 18 percent of those in the low-fat diet group. When researchers accounted for a number of other factors, such as the participants' weight, smoking history and reported exercise levels, the Mediterranean diet itself was linked to 52 percent reduction in diabetes risk compared to the low-fat diet. The findings support existing dietary advice for people with diabetes and those at risk of developing it, said Constance Brown-Riggs, a spokeswoman for the American Dietetic Association, adding that the Mediterranean diet is a healthy choice for anyone. But, she said, the study "does not, by any means, say that you don't have to exercise". She also cautioned against paying attention to calories or seeing olive oil as a magic bullet against diabetes. "Sometimes individuals can get hung up on one item, like olive oil. 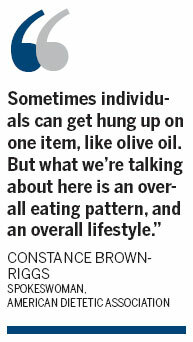 But what we're talking about here is an overall eating pattern, and an overall lifestyle."